Tomb Raider and its infamous heroin, Lara Croft, are a culture phenomenon. While Ms. Croft garnered more attention and mass appeal – both from a gaming and culture standpoint – in the UK rather than the US, it was nearly impossible to live in the late 90s and not know about Tomb Raider. With countless ports and even anAnniversary face lift thanks to now series developer Crystal Dynamics, we delve into the original game once and for all. Join special guest Andy Urquhart along with Fred and Jam as they discuss Lara’s first adventure. Note: This review originally appeared on the B-Team Podcast site and has an agreement with the owner of the review, Fred Rojas, to post on Gaming History 101 as well and visa versa. Typically any game being remade in HD comes with the acceptance that it was already a prominent title, which accounts for the ongoing debate as to whether or not to re-purchase it. That’s why Legend of Kay Anniversary strikes me as such an interesting decision because almost no one played the original on PS2 in 2005 or even the port to DS in 2010. Granted, when you complete the Anniversary edition the phrase “We’ll be back!” is at the end of the credits so I can only guess an upcoming sequel is the reasoning for this beautiful HD remake. Having now played the game to completion I have to admit that Nordic was smart to purchase it from Capcom and this partial Zelda clone does make for a lengthy and impressive campaign. When it originally released, Legend of Kay garnered quite positive reviews and I’m pleased to say that the game is just as great now as it presumably was when it released, only now it has received one hell of a face lift. Okay, I know the Sega CD actually turned 20 exactly one week ago on October 15, but we’ve been very busy over here so we regretfully missed the window. Fortunately we are making up for that with tons of Sega CD coverage for the month of November, check in to see write-ups and gameplay on many of the titles that made Sega’s overpriced add-on a temptation in 1993. Now I know it is popular opinion to crap all over the Sega CD and in full disclosure I’m an avid fanboy of this specific system, but somewhere in between lies its true value. Someone once told me that any console with at least three good games is worth being in existence and under that theory the Sega CD justifies itself at least three times over. In recent days the Sega CD has also dropped in price/value so it’s quite possible to get your hands on a Genesis/CD combo for roughly $50-$75, which isn’t too shabby even by today’s standards. In truth the Sega CD (Mega CD in Japan and Europe) wasn’t designed for our market. It was developed in Japan to compete with the PC-Engine CD (Turbografx-16 Duo in our country) and hopefully migrate the consumers of the time into the CD generation as an unassuming add-on instead of a full-blown machine. 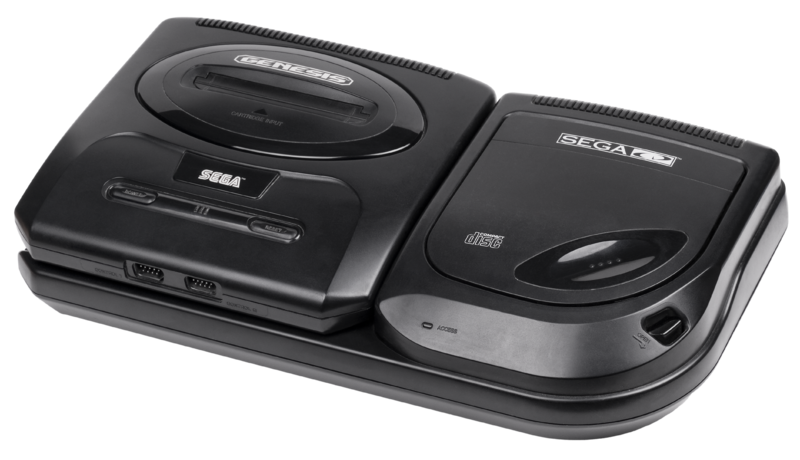 In the end both consoles did make their way stateside (NEC being very conservative with Turbo Duo distribution and Sega liberally releasing any and all hardware in every market) with hefty price tags ($300-$450). Sega CD emerged victorious but many would argue its victory was due more to the fact that almost every game that released in Japan came over here whereas an extremely meager amount of PC-Engine CD titles ever made it stateside. Like the PC-Engine CD, the Sega CD was able to upgrade visuals, considerably upgrade audio quality (especially with straight CD tracks in red and yellow book audio format), and increase capacity of discs to 600 mb when compared to the frail 32 megabit capacity of the Genesis. Sega CD was kept under wraps so tightly that aside from technical specs, many developers of early games had no idea what console they were developing for. Anniversaries. As time progresses everything ages at the same pace and with each passing year a ton of video games hit new milestones. Popular titles from the past can be revisited in short periods of time for the sake of nostalgia or the chance to finally complete a difficult game for the first time¹. Since no one day can go by without something in the video game industry reaching a notable age, it’s no surprise that retro articles are riddled with regular anniversary celebrations. This site will be no exception. Gaming companies have now begun to celebrate series anniversaries themselves on a more consistent basis. In some cases I feel these creations are warranted, but I find myself frowning a bit when it’s a last-ditch effort to revitalize an intellectual property that should have died off long ago. I think the better anniversary is the for titles that stand on their own and you rarely think about until they are brought up. A perfect example of this is Chrono Trigger. Despite a few remakes and Square’s occasional interest in bringing attention to the title, it’s mostly one for the nostalgia vault. Thankfully, unlike so many other titles, Chrono Trigger holds up today and stands as an individual game even though it technically has two other entries in the series². Oddly enough, even though the game celebrated 15 years in 2010, it received a GBA port on its 13th birthday and didn’t come to virtual console and PSN until this year (its 16th anniversary). This only further proves that incremental numbers aren’t always on a publisher’s top priority list.